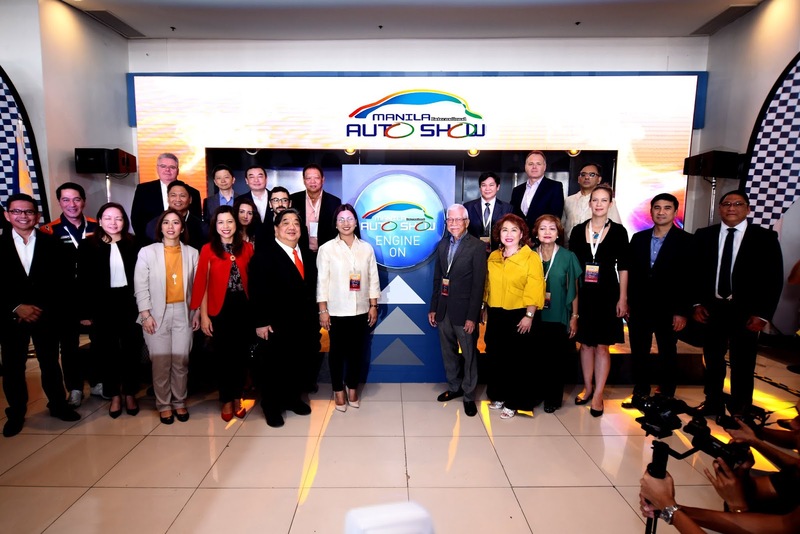 The Manila International Auto Show (MIAS) 2019 ribbon-cutting ceremony held on April 4, 2019 at World Trade Center in Pasay City. (L-R) Mr. Manny Aligada - President of Kia PH, Mr. Dino Santos - President of KTM PH, Ms.Nona Ong- President of Honda and Isuzu Automotive Dealership Inc.,Mr. Bertrand Lessard - President of Ford Philippines,Mr. Jason Ang- MIAS 2019 Co-organizer, Mr. Alvin Uy - MIAS Co-organizer, Ms. Jill Aithnie Ang - WSI Managing Director, Ma. Christina L. Go - BPI Family Family Savings Bank President,Carmen Maria Ramirez Ortiz, Gorka,San Juan - Embassy of Spain,Mr. Joseph Ang- WSI Founding Chairman,Arch. Francisco Flameno- WSI Executive Director, Asec. Goddes Hope Libiran - Department of Transportation, Mr. Gus Lagman - AAP President,Mr. Khamkhoun Pradith,Mr. Levi Ang -WSI Co-founder, Mr. Chris -Brit EM,Ms.Tessie Roque- WSI Director, Dr. Aaman Rashid - Ambassador of Pakistan,Ms. Charlotte Bandelow - Deputy Executive Director of GPCCI,Mr. Felipe Estrella- President of Volkswagen, Mr. Gerry Hernandez - General Manager of Subaru Philippines. The country’s premiere automotive expo, the Manila International Auto Show (MIAS), is back to deliver another exhilarating trade presentation as it officially opens its doors to the public last April 4. Marking its 15th year in the industry, this year’s MIAS is intent on having visitors “Experience Fun and Function” on a whole different level. As is customary, a grand opening ceremony was held during the first day of the show. In attendance during the event were guest speakers Gus Lagman, President of the Automobile Association of the Philippines and Assistant Secretary Goddes Hope Libiran of the Department of Transportation together with Worldbex Services Internationsl (WSI) key executives Joseph Ang, Levi Ang, Arch. Francisco Flameño Jr., Jill Aithnie Ang, Rene Ramos, Tessie Roque, Alvin Uy, Jason Ang, and Ulyssess Ang. Joseph Ang, Worldbex Services, Inc. Founding Chairman. Apart from attracting hordes of show-goers who are planning to make a variety of purchases or simply want in on the latest auto trends and releases, what sets MIAS apart from other run-of-the-mill auto shows are its top-notch event highlights that allow visitors to truly immerse in various auto- and motor-related activities. Among the must-sees and must-dos at MIAS 2019 include a visit to the various car club displays that will be launched to the public at the World Trade Center Driveway. There is also the Monster Truck Display which is located at the North Wing side of the venue. This section is most ideal for those with a penchant for big trucks or are looking to upgrade their business trucks and commercial vehicles for newer and better models. On the opposite side of the spectrum, this year’s Miniature Die-Cast Car Collection Display invites enthusiasts to drop by and appreciate its showcase of the most impressive die-cast collections. Of course, one’s MIAS visit will not be complete without having witnessed any one of Guinness World Record Holder Russ Swift’s stunt performances with his trusty Subaru cars. Meanwhile, those who are looking to buy a new car or simply want to experience what it’s like to ride the latest car models, are free to test drive some of the vehicles that will be displayed outside the venue’s main hall. Another one to watch out for at this year’s MIAS is the Classic Car Competition. Presented in partnership with Petron, the competition will be featuring over a hundred of entries of the most creatively executed car set-ups! Organized by Worldbex Services International for the benefit of the ABS-CBN Lingkod Kapamilya Foundation Inc, the 15th Manila International Auto Show or MIAS 2019 will run until April 7, from 10:00am to 10:00pm at the World Trade Center Metro Manila. For more information, follow @mias on Facebook and @mias.ph on Instagram. Ticket price is P100 and PWD and Senior Citizen’s 20% discount shall apply.